Since writing this article in 2011, I've gone PLASTIC-FREE around the kitchen - including lunchboxes. You can read more about my new lunchbox strategies here. Lunchboxes are a tricky business. And I don't know about you, but I never seem to manage to pack Nelle's the night before. So, imagine it's a typical Monday morning. I haven't yet had my coffee, Robbie's running late for work, I'm trying to get muffins out of the oven for breakfast (because it seemed like a good idea to bake) and I have to pack Nelle's lunch. I needed something simple. A lunchbox 'recipe', that would be true to my #1 food value - Diversity. But that would also make Nelle's lunch attractive and would keep stuff separate when it needed to be (because sandwiches that are soggy because they've been sitting next to fruit do not encourage kids to eat them). 1. A variety of colours, to appeal to the eye. (and I don't count beige!) Colours like Orange. Yellow, Green. Red. Purple. 2. A variety of textures, to appeal to the mouth. Crispy things. Soft things. Chewy things. Smooth things. Rough things. 3. A variety of food types, for a diversity of nutrients. Proteins. Fruit, dried and fresh. Veggies. Sandwiches. Cheeses. Beans. 4. A variety of flavours, because what she likes changes like the wind. Vinegary salads and briny olives. Sesame-sprinkled sushi. Leftover muffins/waffles/plain pasta/roast veggies. Something sweet. 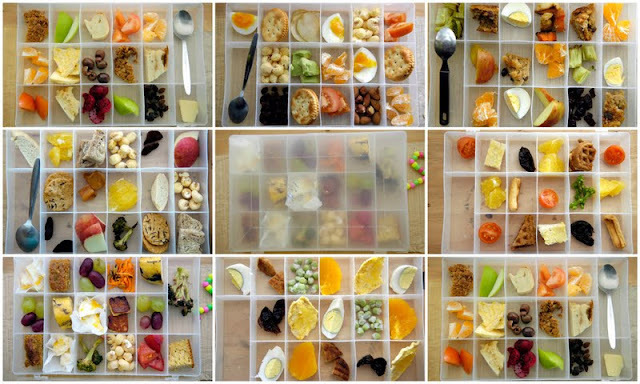 I try to mix up the colours, and I divide foods into 2 or 3 portions that get distributed around the lunchbox. This kind of buffet appeals to her interest and curiosity, and her tendency to pick at little bits of food. So, that's what I do. Sometimes she eats it all ... sometimes she finishes up on the drive home from preschool ... sometimes things in the box get rejected straight-out. But overall, this is the best way to deliver food to my 3 1/2 year old that I've found. Do you have any winner lunchbox tips to share? If so, leave a comment ... we'd all love to hear from you! Labels: Keep the Kids Busy, Life in General, What's for Lunch? How perfect for little fingers! Did I mention that it's brilliant? This is such a novel and excellent idea for little ones. I agree with Cheryl....get this to market with a re-usable/washable colourful spoon/fork! 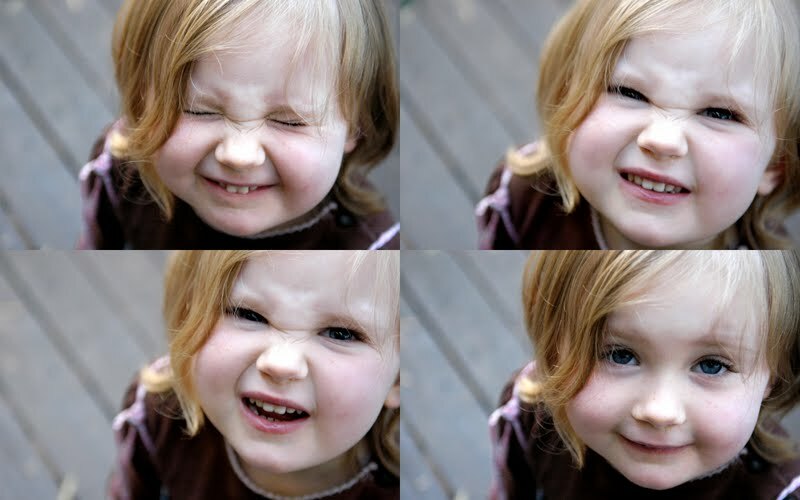 Your daughter has the cutest of expressions and I meant to say that I loved her little bandana in the earlier post. I love this container! I have used a muffin fin before. I think my life has just changed forever!!!!! Fabulous post, THANK YOU!!!!!! Hellooooo affirmation! Thanks for the lovely comments! So anybody here work for a design firm?? I just found your blog for the first time and am glad I did. I'm looking forward to following. BRILLLLLLIANT!!!!! I am doing this as I have one of those, love love love this idea! Amanda - a great idea. I could get a contact for an industrial designer in brisbane if you are interested? I love this idea. Thank you for sharing. I also liked the idea of stainless steel instead of plastic. I found a website called planet box that has an awesome stainless steel lunch box with quite a few small compartments. Its a little expensive, but should last a long time because it is made of stainless steel. Amazon sells them, too. Thank you for the post. This is the best lunch box solution I have come across!